Solvent-accessibility change plays a critical role in protein misfolding and aggregation, the culprit for several neurodegenerative diseases, including amyotrophic lateral sclerosis (ALS). 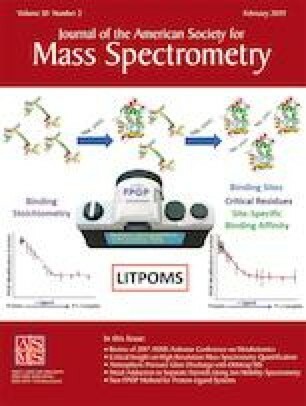 Mass spectrometry-based hydroxyl radical (·OH) protein footprinting has evolved as a powerful and fast tool in elucidating protein solvent accessibility. In this work, we used fast photochemical oxidation of protein (FPOP) hydroxyl radical (·OH) footprinting to investigate solvent accessibility in human copper-zinc superoxide dismutase (SOD1), misfolded or aggregated forms of which underlie a portion of ALS cases. ·OH-mediated modifications to 56 residues were detected with locations largely as predicted based on X-ray crystallography data, while the interior of SOD1 β-barrel is hydrophobic and solvent-inaccessible and thus protected from modification. There were, however, two notable exceptions—two closely located residues inside the β-barrel, predicted to have minimal or no solvent accessibility, that were found modified by FPOP (Phe20 and Ile112). Molecular dynamics (MD) simulations were consistent with differential access of peroxide versus quencher to SOD1’s interior complicating surface accessibility considerations. Modification of these two residues could potentially be explained either by local motions of the β-barrel that increased peroxide/solvent accessibility to the interior or by oxidative events within the interior that might include long-distance radical transfer to buried sites. Overall, comparison of modification patterns for the metal-free apoprotein versus zinc-bound forms demonstrated that binding of zinc protected the electrostatic loop and organized the copper-binding site. Our study highlights SOD1 hydrophobic groups that may contribute to early events in aggregation and discusses caveats to surface accessibility conclusions. The online version of this article ( https://doi.org/10.1007/s13361-018-2075-y) contains supplementary material, which is available to authorized users. This work was supported by NINDS grant P01-NS49134. We thank Dr. Melissa Sondej and Puneet Souda for their aid in mass spectrometry and Dr. Bon-Kyung Koo for her aid in protein expression and purification. The authors thank Prof. Michael Gross and his co-workers for introducing us to the practicalities of setting up FPOP.